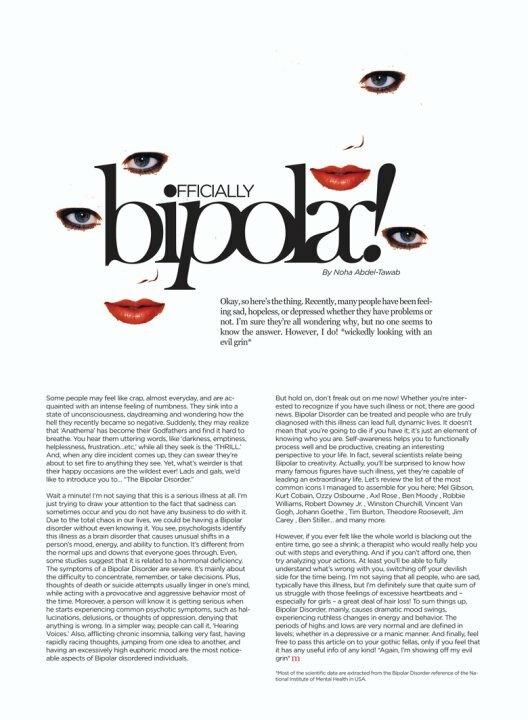 The Moon Is My Home | .. N.O.H.A ..: Officially Bipolar! Wait a minute! I’m not saying that this is a serious illness at all. I’m just trying to draw your attention to the fact that sadness can sometimes occur and you do not have any business to do with it. 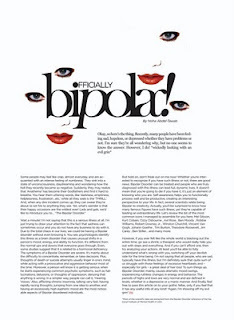 Due to the total chaos in our lives, we could be having a Bipolar disorder without even knowing it. You see, psychologists identify this illness as a brain disorder that causes unusual shifts in a person’s mood, energy, and ability to function. It’s different from the normal ups and downs that everyone goes through. Even, some studies suggest that it is related to a hormonal deficiency. The symptoms of a Bipolar Disorder are severe. It’s mainly about the difficulty to concentrate, remember, or take decisions. Plus, thoughts of death or suicide attempts usually linger in one’s mind, while acting with a provocative and aggressive behavior most of the time. Moreover, a person will know it is getting serious when he starts experiencing common psychotic symptoms, such as hallucinations, delusions, or thoughts of oppression, denying that anything is wrong. In a simpler way, people can call it, ‘Hearing Voices.’ Also, afflicting chronic insomnia, talking very fast, having rapidly racing thoughts, jumping from one idea to another, and having an excessively high euphoric mood are the most noticeable aspects of Bipolar disordered individuals. But hold on, don’t freak out on me now! Whether you’re interested to recognize if you have such illness or not, there are good news. Bipolar Disorder can be treated and people who are truly diagnosed with this illness can lead full, dynamic lives. It doesn’t mean that you’re going to die if you have it; it’s just an element of knowing who you are. Self-awareness helps you to functionally process well and be productive, creating an interesting perspective to your life. In fact, several scientists relate being Bipolar to creativity. Actually, you’ll be surprised to know how many famous figures have such illness, yet they’re capable of leading an extraordinary life. Let’s review the list of the most common icons I managed to assemble for you here; Mel Gibson (Actor and Director), Kurt Cobain (Lead singer of Nirvana), Ozzy Osbourne (Singer), Axl Rose (Lead singer of Guns ‘N Roses), Ben Moody (former Guitarist of Evanescence), Robbie Williams (Singer and former member of Take That), Robert Downey Jr. (Actor), Winston Churchill (British Politician), Vincent Van Gogh (Artist), Johann Goethe (German Writer and Polymath), Edgar Allan Poe (Poet and Literary Critic), Tim Burton (Producer and Director), Theodore Roosevelt (American President), Jim Carey (Actor), Ben Stiller (Actor), Russell Brand (Actor)… and many more. *Most of the scientific data are extracted from the Bipolar Disorder reference of the National Institute of Mental Health in USA. A very competent linguistic tool, truly:). Interesting topic. I've had a great mental pleasure reading it:).